Women in the Feria, with red striped casetas to the right. Every town throughout Andalucia holds its own party between April and October – throughout spring, summer and autumn, from small villages to large cities, such as Malaga, Cordoba, Jerez and Granada, hold their feria (Here is our list). 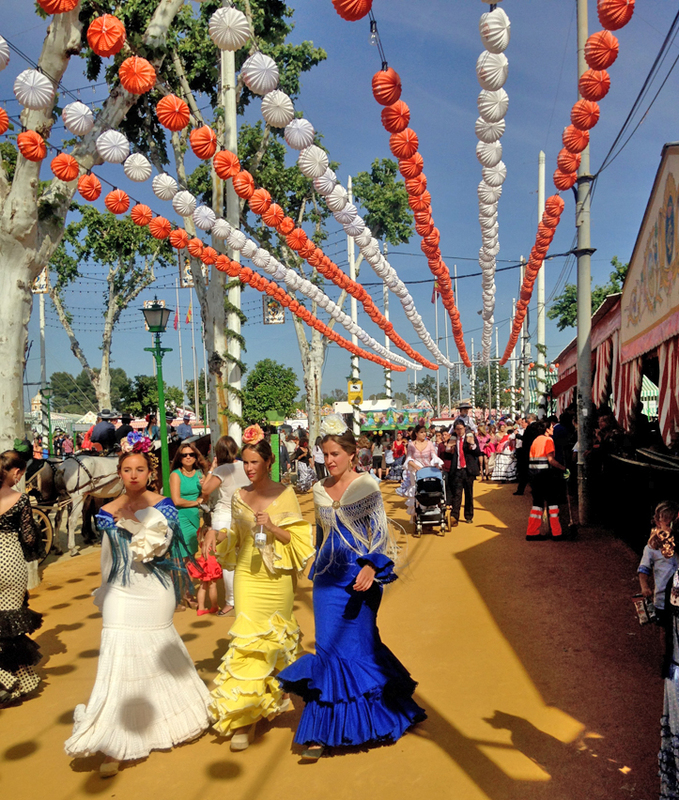 And the first one, to kick off the season in style, is Seville’s Feria de Abril. It is a party for the residents of a town, village or city, whatever its size, held in a large open area often with a yellow sandy floor of albero. Small tents, or casetas, are set up with a bar in each serving food and drink (most popularly beer and fino or manzanilla sherry); music is played, either a live band or digitally; and people dance Sevillanas (a type of flamenco danced in pairs). 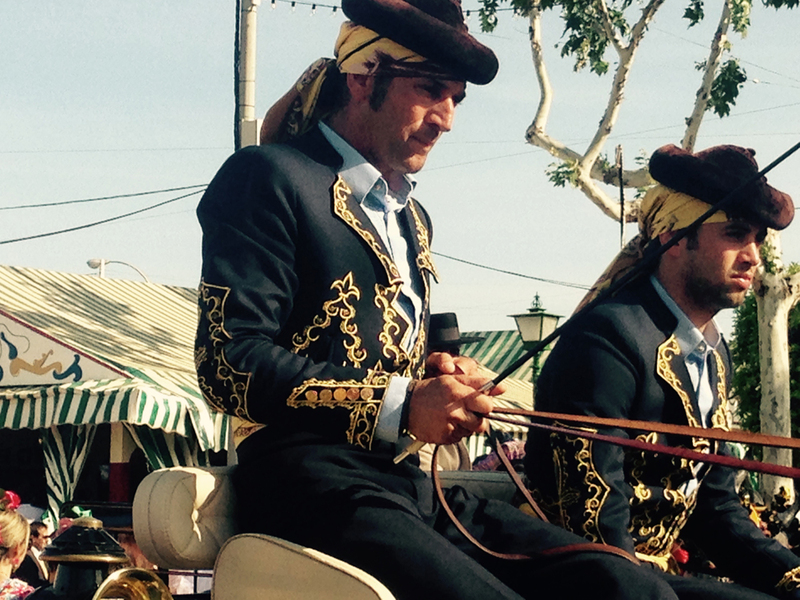 In most ferias, all casetas are open to everyone, except in Seville where only members and their (invited) friends are allowed to enter. They eat, drink, dance, talk, then drink and dance some more. Business deals are struck, love matches are made, friendships cemented or left in tatters. The action goes until about 3am, when everyone staggers home, then gets up the next day, come back and does it all again. Hangover, what hangover? If you’re a jinete or an amazona (horseman or woman), you groom your horse so his coat is gleaming, tie his tail into a complicated plait effect, then ride around the fairground with your friends, and possibly your girlfriend sitting decoratively behind you in her traje de flamenco, side-saddle with her arm around your waist. Girls wearing flowers in hair and mantones (shawls). Women wear a long traje de gitana, or flamenco dress, which is close-fitting down to just above the knees, then a skirt with frills (volantes). They can come in any colour, plain or patterned (usually spots but also floral), and accessories are selected to coordinate – so if you have a blue and green dress, you could choose either a blue or green flower to wear in your hair, with matching fringed scarf (manton) worn around your shoulders and pinned at the front with a brooch, earrings (the bigger, the better), necklace and fan. Men wear suits. Horses wear tiny coloured pom-poms all along their bridles. Horseriders have their own outfits – men wear the traje corto, a cropped jacket with trousers and wide-brimmed cordobes hat. Carriage drivers in Ronda-style jackets, with scarves and velvet hats. Carriage drivers have a variety of outfits – with matching headwear. One of my favourites is the rondeño (as in, from Ronda), with a little velvet hat with an oriental-style point, and sometimes a beautiful embroidered jacket. 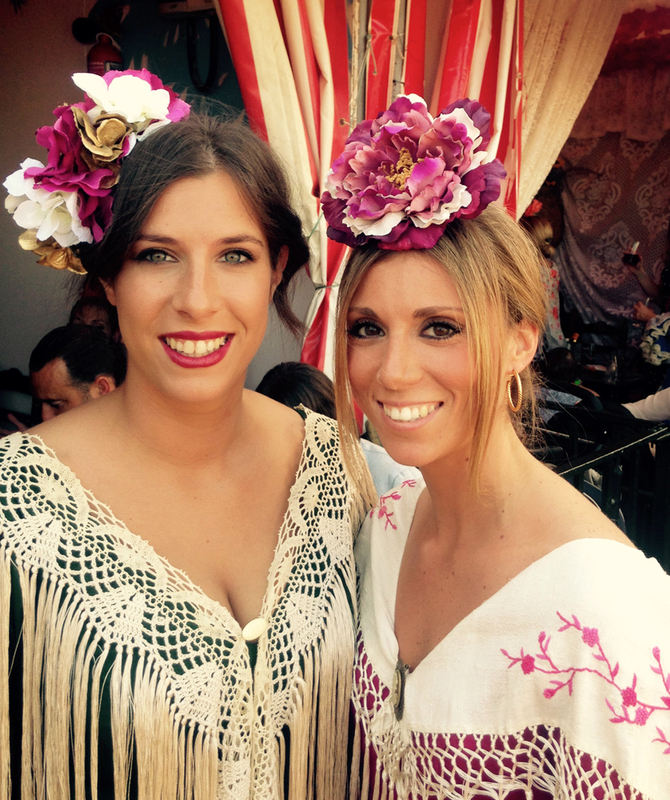 All in all, the annual feria is a time to cast off your worries and dress up to the nines (women spend months planning their outfits, with extraordinary attention to detail in the accessories).